We recently upgraded our primary large-area horizontal CNC table saw to a large-area vertical saw. 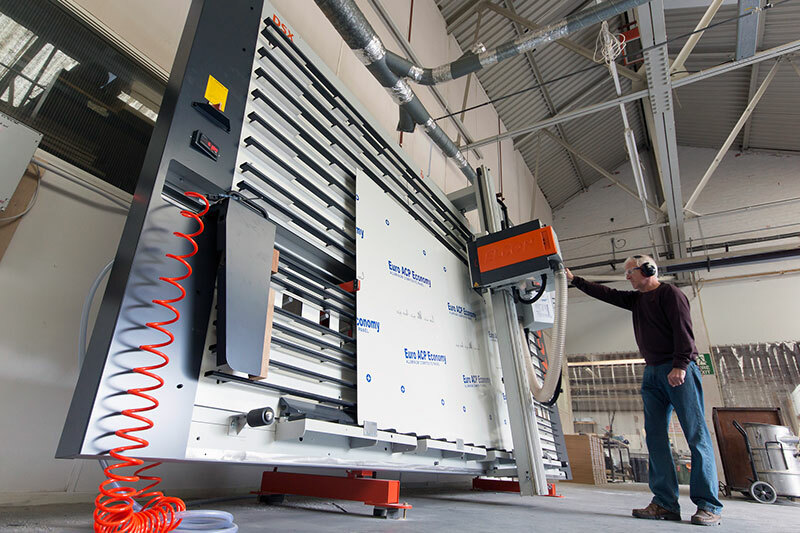 We had reached the conclusion that, with ever more reliance on CNC routers and our suppliers for accurate material cutting, we needed to modernise. Our CNC table saw occupied a large area of factory floor and it was difficult to extract dust from its cutting area. After considering all the available machines we chose to invest in an Elcon DSX 215 freestanding vertical saw, supplied and commissioned by Daltons Wadkin. The huge amount of space saved gave us the opportunity to review and improve our entire machine workshop layout, with particular attention given to the safe operation of various machinery as well as dust and waste collection and disposal. · Capable of cutting up to 80mm thick materials such as wood, aluminium, composite, acrylic and PVC and many other features.